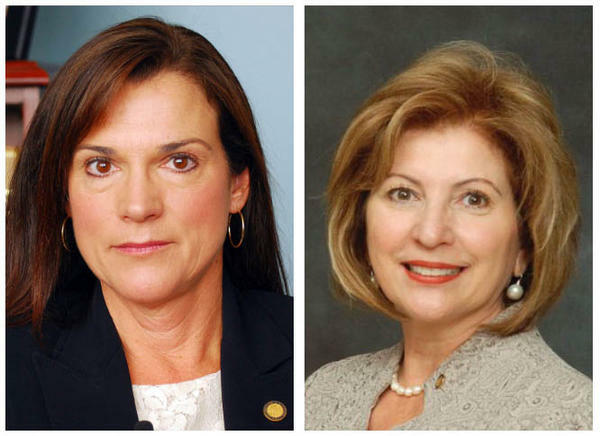 Republican incumbent Dana Young (left) and Democrat Janet Cruz (right) are locked in a razor-thin fight to be the next state senator for district 18 in Hillsborough County. Despite Democrat Janet Cruz declaring victory Wednesday afternoon, the razor thin margins in her race against Republican incumbent Dana Young will likely lead to a recount. Only 289 votes separated the two candidates as of Thursday afternoon. Hillsborough County Supervisor of Elections Craig Latimer said the close vote tally will trigger an automatic recount. Under state law, ballots will have to be run through the machines again if the race is within a margin of half a percent. "That's the situation we're in right now with the Senate 18 race," Latimer said. "Those candidates are .14 percent apart, so that would certainly meet the threshhold." If the race has a margin of under .25 percent after the machine recount, ballots will be checked manually. Florida Secretary of State Ken Detzer will have to order the recount, a decision that may not come till this weekend when local elections officials must provide official vote counts. There are also more than 750 provisional ballot that have not been counted. The fate of those ballots will be decided at a meeting of the Hillsborough canvassing board tonight at 5 p.m.
"Those will be presented to the canvassing board today with a recommendation to either accept them or reject them for whatever reason," Latimer said. "We also have some vote-by-mail ballots that, for one reason or another, the machine wouldn't read them. Everything will pretty much be in by the end of the day here." Cruz and Young are vying to represent residents in District 18 that includes Town and country, West Tampa and South Tampa. Tim Wagner, Cruz's campaign manager, said they announced themselves the winner on Wednesday because they are confident the remaining provisional ballots will not change the outcome. "We have a 289 vote lead," Wagner said. "Based off of that lead and conversations we've had with the supervisor of elections, we feel comfortable in that lead and that it would be very difficult for our opponent to find 289 new votes." A spokesperson for the Young campaign said they will "continue to monitor the process and wait for the official results to be certified." Both candidates will have staffers and lawyers on hand as the machine recount process moves forward. Latimer said no race in Hillsborough County has been overturned by a recount in the last decade.